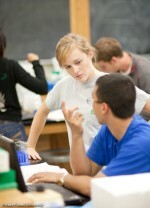 The Outreach Core focuses on integrating the TSC into the university and the local and regional scientific communities. Outreach efforts target basic and clinical scientists and students with translational interests in functional health in aging on the Reynolda campus, the Wake Forest University Medical School, Winston-Salem State University, and Salem, Guilford and Bennett Colleges. The multidisciplinary aspect of translational research allows interaction between basic science, social science and clinically-directed departments. Current outreach efforts are focused on a multi-campus undergraduate summer research program and an interdisciplinary translational science seminar series. The Undergraduate Summer Research Program introduces these students to scientific research in the translational sciences and represents a major outreach goal of the Center. Students are recruited from various departments at Winston-Salem State University, Salem College, and Bennett and Guilford Colleges to participate in a summer research project in an affiliated TSC laboratory. This program provides a unique opportunity for students from these campuses to participate in clinically-relevant, interdisciplinary research projects that currently are not available to them. The Interdisciplinary Translational Science Seminar Program is instrumental to introducing faculty, fellows and both graduate and undergraduate students to research being conducted in this area locally, nationally, and globally.